Formerly known as Teen Spirit, Jaangle, a free music player, music collection organizer, tag editor and also music quiz game, is a powerful music tool that music enthusiasts can look to if they are looking for a heavy duty all-in-one music solution. Unlike other music players/organizers, the most fascinating part about this application is its wide play capabilities and format support such as mp3, mp2, wma, cda, ogg, mp1, aiff, xm, it, s3m, mod, mtm, umx, mo3, mpc, flac, mid, midi, ac3, mp4, ape, m4a, etc (audio) and mpg, avi, mpeg, wmv, mp4, etc (video). This music player does not consume a lot of system resources for playing audio files based on the excellent bass engine. Users can via Jaangle create multiple music collections and organize music files in various preferred ways. Users can download and store useful information such as album covers, album reviews, lyrics, artistes’ biography, personal ratings and more from sources such as Amazon, LastFM and Google to display the information every time users play the music. 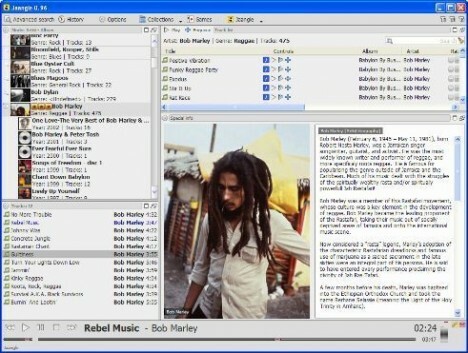 Jaangle comes with a Music file tag editor which allows users to do tagging, ID editing, etc. Jaangle also features some variations of a music quiz game to test and challenge users’ knowledge on music. Jaangle can be downloaded via the link here and it is compatible with Windows XP/2003 and Vista.